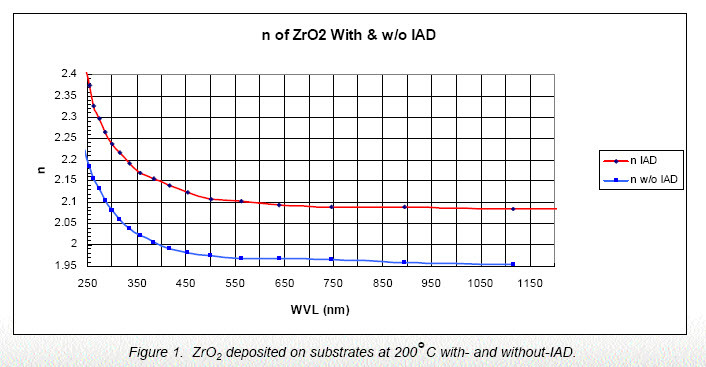 Zirconium Dioxide, ZrO2, is a high index, low absorption material usable for coatings in the near-UV (<300 nm) to IR (~8 μm) spectral regions. Dense layers with exceptional hardness can be deposited by electron- beam evaporation or by sputtering. Typical applications include near-UV laser AR and dielectric mirror designs that require high laser damage thresholds. Zirconia can be used in combination with Silicon Dioxide layers to form high index-contrast multilayer structures with low mechanical stress. Hard, scratch-free and adherent coatings can be deposited using low-temperature techniques such as IAD or sputtering, and is therefore particularly applicable to protecting metal mirrors from abrasion. Completely oxidized Zirconia films exhibit low absorption over the wavelength range ~250 nm to at least 10 μm. Extinction coefficient is less than ~ 0.001 above wavelength ~250 nm. The dispersion in index between 450 nm and at least 1500 nm is small, an advantage for wide-band coating designs. Evaporation causes some amount of dissociation and oxygen loss, which must be restored by supplying a partial pressure of oxygen during deposition. Adhesion is excellent to glass, to most other oxides, to some polymers and to metals such as Aluminum and Silver. The films generally grow with a crystalline microstructure. Under some evaporation conditions, such as low energy resistance-heated evaporation, low substrate temperature, or exces-sive background pressure, the films grow with significant void volume (packing density <0.8) and exhibit index changes when vented to moist air. In addition, absorption bands in the 2.9 μm (O-H stretching) and 6.9 μm (O-H-O vibration) can appear. When deposition is done by sputtering, energetic ion assist (IAD), or at very high substrate temperatures, the index changes and water absorption bands can be eliminated. The refractive index responds to high energy deposition techniques and to substrate temperature because both parameters decrease the void volume by increasing the packing density of the microstructure. Postdeposition baking in air can raise the refractive index of electron-beam and resistanceheated depositions. Some amount of index inhomogeneity can appear with increasing layer thickness and with layer number in a multi-layer design as source material is consumed. The effect can be reduced by providing sufficient oxygen backfill during evaporation but avoiding excessive pressure that tends to create voids which will absorb water vapor upon venting the vacuum chamber to atmosphere. Zirconia is among the number of oxide compounds whose tendency for inhomogenous index gradients can be reduced by the introduction of foreign oxides. Additives such as Titanium Oxide, Silicon Dioxide, Magnesium Oxide, and others modify the crystalline growth behavior [1, 2]. The refractive indices are dependent on the degree of oxidation and the film density achieved. Both of these parameters are affected by substrate temperature and IAD energy. IAD increases the packing density, and thus the refractive index by a substantial amount. The penalty is increased absorption, a problem for high-energy laser coatings, as seen in the figure at right. The starting material form is either tablets or sintered pieces. Recommended preconditioning consists of rapidly sweeping a low power electron beam to slowly and uniformly heat the surfaces of the material. Monitor the pressure and crucible to decrease outgassing and spitting to an acceptable level while slowly increasing the power to just below evaporation temperature. Tablets or pieces can be added to refill the melt for subsequent evaporations. Source Container Graphite liner is E-beam. Electron beam should be swept. Thick tungsten boat for resistance headed evaporation. Tungston will react and must be replaced after one evaporation. Materion offers materials for evaporation as well as sputtering targets. To view pricing on our standard catalog items, please visit our online catalog and search by item number, chemical name or CAS number. If you require a custom manufactured item, please contact Contact Us: 414-289-9800; OrderChemicals@Materion.com. 1. Elmar Ritter, Appl. Opt. 15 (10), 2318 (1976). 2. F. Stetter, R. Esselborn, N. Harder, M. Fritz, and P. Tolles, Appl. Opt. 15(10), 2315 (1976).